Karns provides you with access to your registration information and the ability to edit this information. You can make choices about how your Karns account information may be used by Karns to provide marketing offers to you. In order to do so, please visit the My Account area and review your Karns communication preferences. These preferences apply to communications that are directly related to your registration with the program, such as email and/or SMS notifications. Because the choices you make in connection with your Karns account may not take effect immediately, it is possible you may receive a communication during the period in which your request is being processed. To operate and improve the website, services and offerings available through program. To personalize the content and advertisements provided to you. Optionally to communicate with you and respond to your inquiries. To conduct research about your use of the program. Information about you as a Karns user may be accessed and disclosed in response to legal process (for example, a court order, search warrant or subpoena) or in other circumstances in which Karns believes the program is being used in the commission of a crime. You may be provided other privacy-related information in connection with your use of offerings from the program, as well as for special features and services not described in this policy that may be introduced in the future. Information about the services/offerings you use, and frequency of use. Information about your visits to the program website and your responses to the offerings presented. Information about how long you have used services in the program. Transaction-related information regarding the history of products purchased through the program. Customer service information about you as a program user. Information specifically related to your use of a particular service or offering. 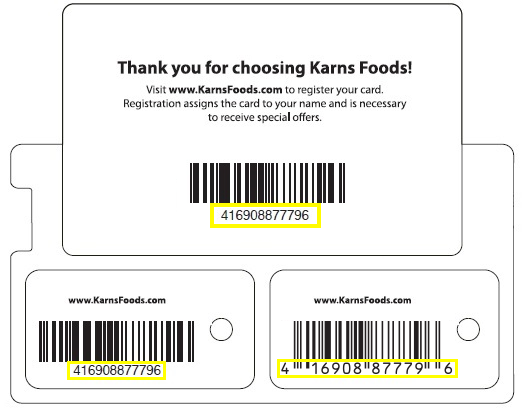 Additionally, the Karns Fresh Rewards program will use your registered telephone number to authenticate you on the in-store network to enable you to take advantage of program offerings.